Yep, I’m still on bloggy hiatus for the rest of the month, but there are a few book reviews that’ll be going up in the meantime to prove that I’m still alive… relatively speaking. 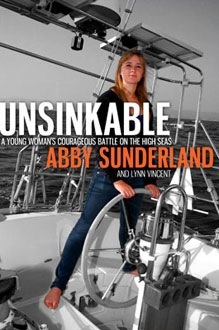 The stirring narrative of Unsinkable tells sixteen-year-old Abby Sunderland’s remarkable true story of attempting to become the youngest person ever to sail solo around the world. More people have flown into outer space than have sailed solo around the globe. It is a challenge so immense that many have died trying, and all have been pushed beyond every physical, emotional, psychological, and spiritual limit. 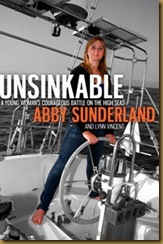 In Unsinkable, readers follow Abby Sunderland into those depths. This biography delivers a gripping and evocative firsthand account that starts prior to her departure, travels through her daring (and sometimes near-death) encounters on the open sea, to her dramatic rescue in the remotest corner of the Indian Ocean, and the media explosion that happened upon her safe return to dry land. Along the way, readers discover what it means to boldly face any challenge, to strive after something great, and to plumb the depths of faith, fear, and desperation only to emerge changed, renewed, and emboldened. In this day and age, when the most productive thing a teenager may do is play videogames, Abby’s ambition and tenacity is a real-life parable of what can happen when we choose to exceed our own limits, embrace faith, and strive after what all the naysayers say is impossible. First of all, I resent the videogames comment in the synopsis. Just sayin’. I’m no teenager, but why not say “play Boggle” or “play soccer”? Videogames get a bad rap, despite all the studies on their benefits. Grrr… sorry, this is a sore spot for me. But anyway. Back to the book. I’ll be first in line to admit that I thought Abby’s parents were crazy to allow their 16-year-old daughter to sail around the world, alone. I remember reading about this in the paper, as well as reports about another girl attempting it at the same time, and wondering… what are their parents on? What kind of adult lets their teenage daughter sail solo around the world??? Do they want her to die or get kidnapped by pirates? Well, after reading this book… I still think her parents are a bit nuts to allow it. But at the same time, Abby seems like a capable young woman, and she definitely knew/knows her way around a boat. Heck, I didn’t even understand what was going on half the time, because she explains getting out of tricky or dangerous situations by recounting exactly what she did on board the boat and, uh, marine terminology is not my strong suit. Fortunately, there’s a detailed glossary and labeled boat diagram at the back of the book for those of us who need it. After reading the book, I understand why her parents let her make the journey, and I can’t even begin to imagine what it must have been like out in the ocean during things like 30-foot swells, or going for days without being dry, or having the engine fail and communications die at the worst possible time. It’s a pretty incredible story, and Abby and her family’s faith is clear and strong throughout. If you’re not all that familiar with boats and marine terminology, parts of the story will be a struggle to get through, but either way, by the last page you’ll have to admit that this young woman was—and is—a capable, strong, and courageous sailor. Abby Sunderland is among the third generation in a family of sailors and adventurers. 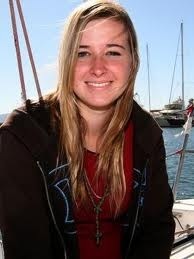 In 2007, at age 13, Abby discovered her dream of sailing solo around the world and was inspired by her brother Zac’s successful circumnavigation in 2009. Her own journey, in 2010, ended in the Indian Ocean when a rogue wave rolled her sailboat, Wild Eyes. Abby now shares her story of tenacity and courage with audiences everywhere. Lynn Vincent is the New York Times best-selling writer of Heaven Is for Real, Same Kind of Different as Me, and Going Rogue: An American Life. The author or coauthor of ten books, Lynn worked for eleven years as a writer and editor at the national news biweekly WORLD Magazine covering politics, culture, and current events. A U.S. Navy veteran, she teaches writing at colleges and conferences around the country. Lynn lives in San Diego, California. “Book has been provided courtesy of Thomas Nelson and Graf-Martin Communications, Inc. Available at your favourite bookseller from Thomas Nelson”. This entry was posted on Sunday, May 15th, 2011 at 3:51 am	and is filed under Tasty Tomes. You can follow any responses to this entry through the RSS 2.0 feed. Both comments and pings are currently closed. Great review. And I agree with the teenager comment wholeheartedly! I remember thinking the same thing when I read about her. Still, I felt sorry when she didn’t reach her goal.